As the energetic particles of the solar wind speed across interplanetary space, their motion is modified by objects in their path. A study, based on data from ESA's Mars Express orbiter, has thrown new light on a surprising interaction between the planet Mars and supersonic particles in the solar wind. 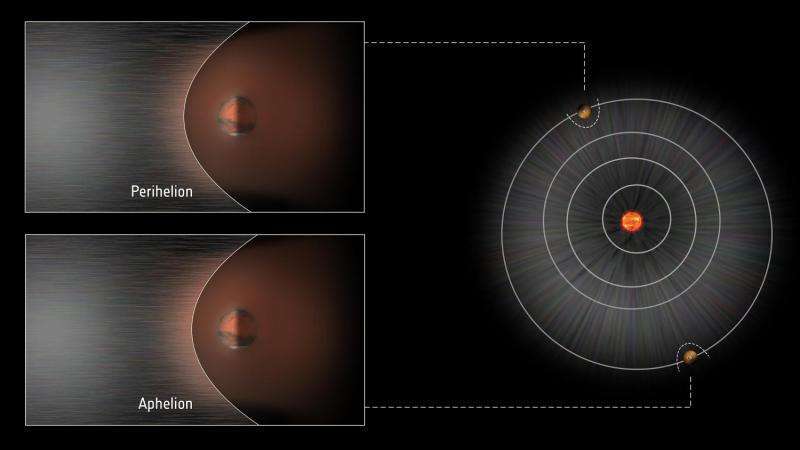 Scientists have long been aware that a feature known as a bow shock forms upstream of a planet – rather like the bow of a ship, where the water is slowed and then diverted around the obstacle. The bow shock marks a fairly sharp boundary where the solar wind slows suddenly as it begins to plough into a planet's magnetosphere or outer atmosphere. In the case of Mars, which does not generate a global magnetic field and has a thin atmosphere, the main obstacle to the solar wind is the ionosphere – a region of electrically charged particles in its upper atmosphere. Furthermore, the relatively small size, mass and gravity of Mars enable the formation of an extended exosphere – the outermost layer of the atmosphere, where gaseous atoms and molecules escape into space and interact directly with the solar wind. Observations made by numerous spacecraft over many decades have shown that variations in the ionosphere and exosphere play a role in changes in the location of the bow shock boundary. As expected, the distance of the Martian bow shock from the planet increases as the dynamic pressure of the solar wind decreases. This is rather like a weakening of the bow wave ahead of a ship as the water's flow slows down. On the other hand, increases in the distance of the Martian bow shock coincide with increases in the amount of incoming solar radiation at extreme ultraviolet (EUV) wavelengths. Consequently, the rate at which ions and electrons are produced from atoms and molecules in the upper atmosphere increases. This results in increased thermal pressure within the ionosphere, enabling it to better counteract the incoming solar wind flow. At the same time, newly created ions within the extended exosphere are picked up and accelerated by the electromagnetic fields carried by the solar wind. The result is a slowdown in the solar wind and a shift in the position of the bow shock. Another possible factor in influencing the bow shock's location is the orbit of Mars. The planet's distance from the Sun is much more elliptical than that of Earth, ranging from 206 million km to 249 million km – a 20 percent difference. 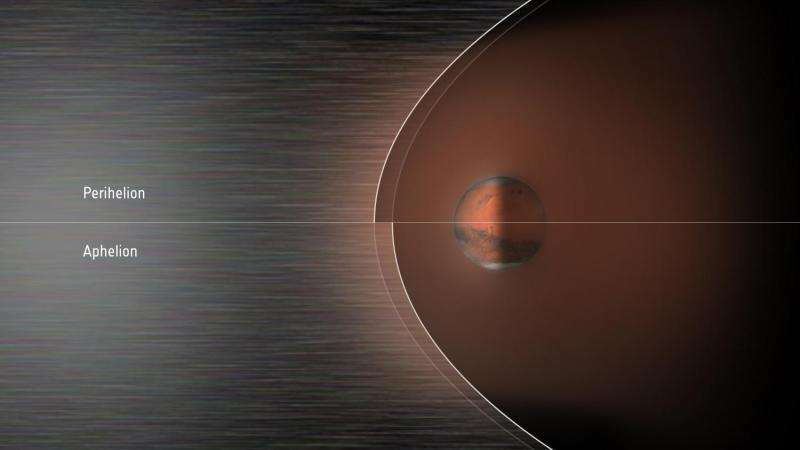 A team of European scientists has investigated how and why the bow shock's location varies during the Martian year. In a paper published online in the 21 November 2016 issue of the Journal of Geophysical Research: Space Physics, the team has analysed more than five Martian years of measurements from the Mars Express Analyser of Space Plasma and EneRgetic Atoms (ASPERA-3) Electron Spectrometer (ELS) to identify 11 861 bow shock crossings. 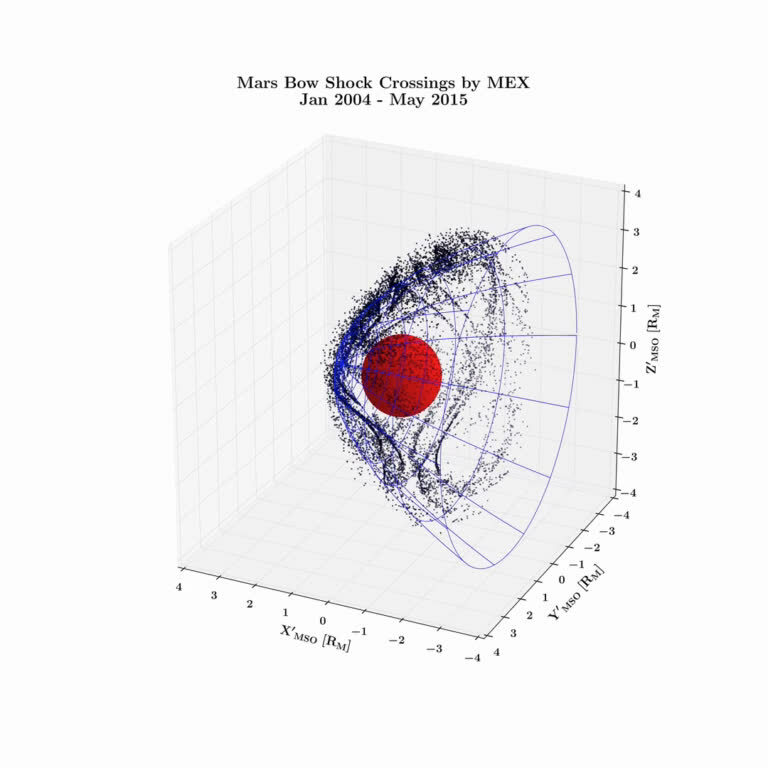 This is the first analysis of the bow shock to be based on data obtained over such a prolonged period and during all Martian seasons. As Mars Express crosses the Martian bow shock the ELS instrument typically registers a sudden increase in flux of electrons across a wide range of energies (typically up to a few hundred eV). 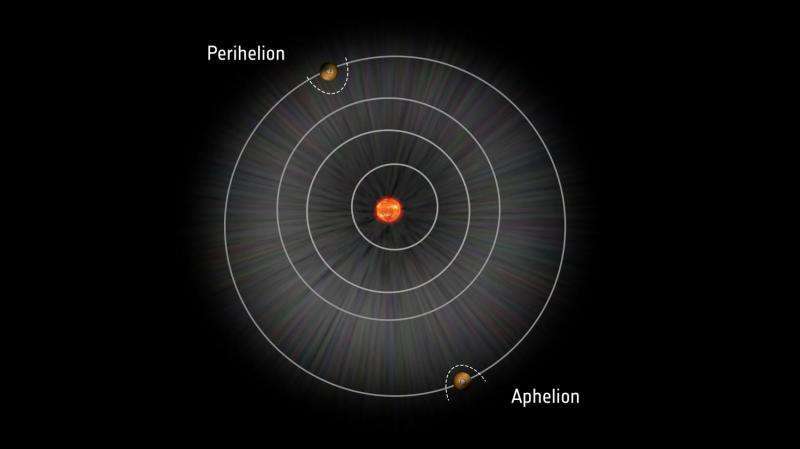 The scientists discovered that, on average, the bow shock is closer to Mars near aphelion (the planet's furthest point from the Sun), and further away from Mars near perihelion (the planet's closest point to the Sun). The bow shock's average distance from Mars, when measured from above the terminator (the day-night boundary) reaches a minimum of 8102 km around aphelion, while its maximum distance of 8984 km occurs around perihelion. This is an overall variation of approximately 11 percent during each Martian orbit. The team also verified previous findings that the bow shock in the southern hemisphere is, on average, located farther away from Mars than in the northern hemisphere. However, this hemispherical asymmetry is small (a total distance variation of 2.4 percent), and the same annual variations in the bow shock occur irrespective of the hemisphere. Solar wind density (and, therefore, dynamic pressure), the strength of the interplanetary magnetic field, and solar irradiation, are all expected to reduce with distance from the Sun. Since these parameters impact the bow shock location in different ways, the team wanted to find out which is the dominant factor throughout the Martian year. Their somewhat surprising discovery was that the bow shock's location is more sensitive to variations in the solar EUV output than to solar wind dynamic pressure variations. This may be largely due to the well recognised impact of EUV on the density and thermal pressure of the ionosphere, and the expansion of the exosphere (see above). These processes create buffers against the solar wind. However, the variations in bow shock distance also correlate with annual changes in the amount of dust in the Martian atmosphere. The Martian dust storm season occurs around perihelion, when the planet is warmer and receives more solar radiation. "Dust storms have been previously shown to interact with the upper atmosphere and ionosphere of Mars, so there may be an indirect coupling between the dust storms and bow shock location," said Benjamin Hall, lead author of the paper, who was until recently at the University of Leicester, and is currently a researcher at Lancaster University, UK. "However, we do not draw any further conclusions on how the dust storms could directly impact the location of the Martian bow shock and leave such an investigation to a future study. "It seems likely that no single mechanism can explain our observations, but rather a combined effect of all of them. At this point none of them can be excluded. "Future investigations of links between atmospheric dust loading and the Martian upper atmosphere are needed, involving joint investigations by ESA's Mars Express and Trace Gas Orbiter, and NASA's MAVEN mission. Early data from MAVEN seem to confirm the trends that we discovered." "Similar investigations were made by the ASPERA instrument that was flown on board the Venus Express orbiter, enabling us to compare physical processes and conditions at two very different planets that both have weak magnetic fields," said Dmitri Titov, ESA's Mars Express Project Scientist. "This demonstrates the value of using the same instrumentation to explore different worlds." "Dust storms have been previously shown to interact with the upper atmosphere and ionosphere of Mars, so there may be an indirect coupling between the dust storms and bow shock location,"
Until the plasma ignoramuses start to consider the electrodynamic properties of plasmas and how bodies immersed in them interact all of these phenomena will remain "mysterious" and "surprising". BTW, the dust storms are a response to the electrical propeties of the planet's interaction with the solar plasma. Not just due to solar irradiance. Utter crap above from two science ignoramuses. As per usual. The behaviour of the solar wind at unmagnetised planets will be little different to that seen at comets. We should expect similar behaviour at Mars and Venus. As measured. As Venus, like the comets, has no appreciable intrinsic magnetic field, the solar wind interaction with her is likely to be essentially the same. And, it should be noted, that it was Alfven, in 1957, who first described the 'folding umbrella' behaviour of the solar wind magnetic field around comets. Which turned out to be correct. As measured. .....how can a layer of charge repel the solar wind? It's not repelling anything, you idiot. Jesus. .... it is, however, not at all clear how the interplanetary magnetic field could mix with the cometary plasma in the tail because the ***solar wind*** and the associated interplanetary field is seperated from the cometary plasma by a ***contact surface***. And then work through decades worth of papers predicting the SW behaviour at comets, followed by decades more confirming the predictions. Then just have a look at the expected SW behaviour at unmagnetised planets, such as Venus and Mars. And the observed results. And then tell us why you are making such uneducated comments. BTW, the dust storms are a response to the electrical propeties of the planet's interaction with the solar plasma. Reference, please. You do realise that the solar plasma is not actually reaching the surface, yes? And yet it does reach the surface of the Moon. And yet we don't have dust storms there. I think, as all the literature will tell you, that it is down to heat + atmosphere + dust. As is bleeding obvious to anyone with half a brain. The Solar Wind interaction with Mars: Locations and shapes of the bow shock and the magnetic pile‐up boundary from the observations of the MAG/ER Experiment onboard Mars Global Surveyor. The fluid analogy will not get you to first base with any of these observations. Energy release through magnetic merging (reconnection! ): Possible. Well. looks like neither Reeve nor Cantthink wish to comment further on Alfven's views on the interaction of the solar wind with planetary atmospheres. Nor his thoughts on the frozen-in field. Nor the possibility of magnetic reconnection. Still, hardly surprising, eh? Seeing as they keep lying to everyone about it. Who was that other chap? Oh yes; Falthammar, wasn't it? He'll tell you about reconnection. And he won't call it 'merging'! Lol. Sad buggers. "Realizing that the magnetosphere cannot be understood until the electric field is mapped, Viking has placed emphasis on electric field measurements. Because energy is transferred from the solar wind mainly through electric currents in the active plasma regions..."
And jonesdumb obviously is too dense to understand the difference in modeling the ionosphere alone vs the solar wind ionosphere interaction. The concept that these are two different considerations is too much for him to comprehend. "Some of the results of the Viking mission are important as a basis for drawing the circuit of energy transfer from the solar wind to the magnetosphere and ionosphere..."
Hmmm, the circuit of energy transfer... It should also be clear that the circuit doesn't stop there but also includes the atmosphere and the planet itself. This is the source of energy which charges the already proven electrically active dust and solves the riddle posed by the inability for saltation to account for the high electric fields created in those dust storms. More idiocy from the woo merchants above. The ionosphere is massively more conducting than the surface. Why would the SW ions decide to ignore that, and continue on through it to the surface? Sheer ignorance. Please point me to anything within the scientific literature that says that dust storms on Mars are due to the interaction with the SW. There is nothing. Because nobody is stupid enough to believe that. It should also be clear that the circuit doesn't stop there but also includes the atmosphere and the planet itself. Wrong. Read the Alfven papers I mentioned. As with comets. the SW, and its magnetic field, are stopped by a contact surface. That is where the diamagnetic cavity is formed. As measured at Mars, also. No magnetic field = no electric woo. As shown at Mars, comets and artificial comets. It is a stupid idea, not at all well thought through, by Velikovskian woo merchants, with little to no understanding of the science and processes involved. Why do you think such garbage doesn't appear in the scientific literature? Because people would laugh. A lot. Why You need literature while dust devils glow is observational fact? So jonesdumb is insisting I provide something peer-reviewed... If it was a mainstream paper by the plasma ignoramuses it would likely need to be "reworked" as is the case in this article about actual plasma experiments and the resulting falsification of theoretical mumbo jumbo. 20-years of peer-reviewed theoretical mumbo jumbo produced by the plasma ignoramuses to which jonesdumb is a card carrying member.